This was a non-determination appeal to which the Department put forward 8 draft reasons for refusal. Carey Consulting was appointed to address two refusal reasons relating to the issue of flooding and five refusal reasons relating to roads. 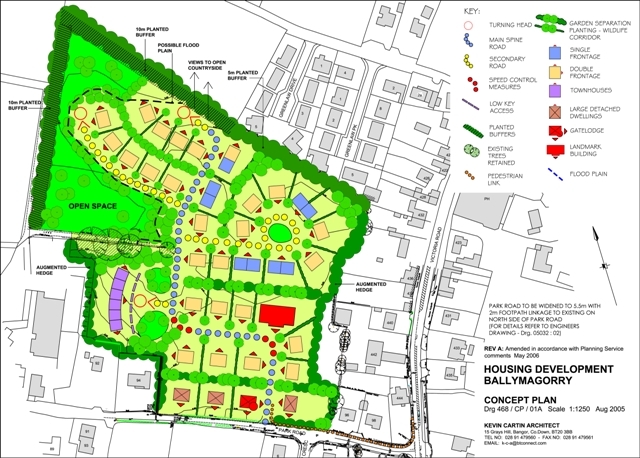 The Project Architect was Kevin Cartin Architects Ltd.
Carey Consulting provided Roads Service with a proposed Access Arrangement Drawing prior to the Appeal Hearing and negotiated with Roads Service that on the basis of the acceptability of the access arrangements proposed that they would withdraw their 5 draft refusal reasons. We also liased directly with Rivers Agency prior to the Appeal Hearing to ensure that the proposed Site Concept Plan satisfactorily overcame the flooding issues which had been identified on the site. As a result Rivers Agency similarly withdrew their two draft reasons for refusal at the Appeal Hearing. As all the Draft Reasons for Refusal were withdrawn and due to all other matters having been satisfactorily addressed the Appeal was allowed.